I would like to see more columns (e.g. 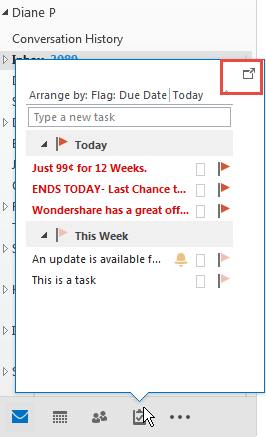 task priority) in the task section of calendar view (in e.g. weekly view mode) and sort the tasks in that list (e.g. by priority). Currently you can drag and drop to sort the order, but that's not much use if you can't see the priority of the task! 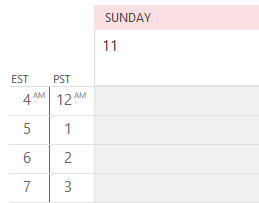 If you’re not familiar with the Task List, you can enable it when the Calendar is in Day or Week views by going to the View tab, Daily Tasks List, and selecting Normal. There is one option that might suffice: dock the Task peek to create a To-Do Bar then customize the view in the To-Do Bar pane. 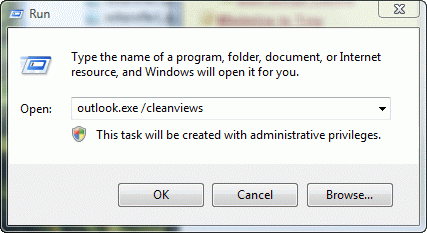 To dock it, open the Task peek and click the Dock icon in the upper right, or right click on the Task icon and choose Dock the peek. To customize the view in the docked Tasks peek, right click on Arrange By at the top of the tasks then choose View settings. Customize the view using the same options you have in any other folder. Your workaround is fairly good!! You can configure the sidebar and then drag and drop items from there to either daily tasks under each day or as actual meetings. Sort of revolutionizing how I handle tasks now!! You can customize the task list in the peek too. Right click on Arrange By: to access the menu. One setting you may want to change is the Compact layout width. 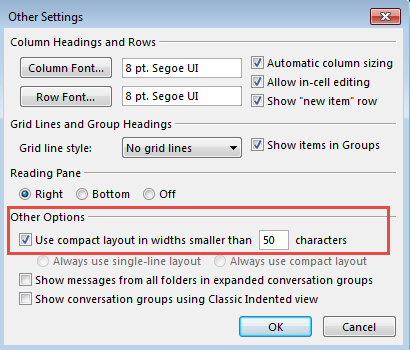 In View Settings, click Other Settings then change Use compact layout in widths smaller than nn characters to 50. This drops the Task list to the non-compact view with just a little movement to the left. 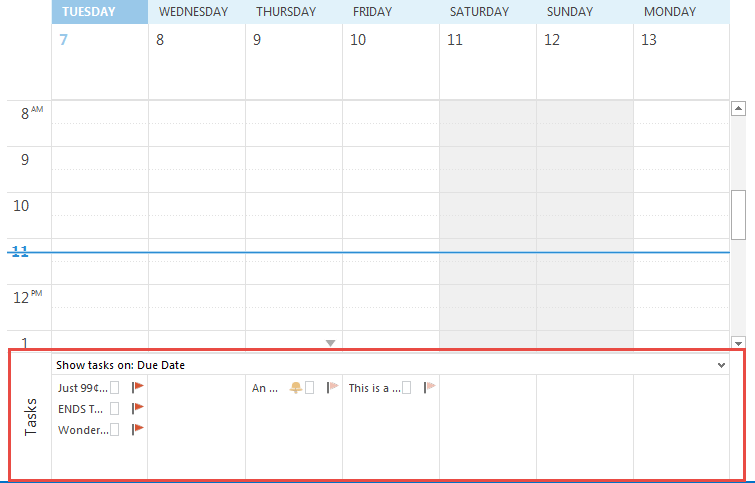 You can easily flip back and forth between seeing all fields in the view, and the "friendly" default view by sliding the vertical bar between the task list and the calendar. Slide the bar left to see fields not in the view and slide it right to shrink it to the compact view. 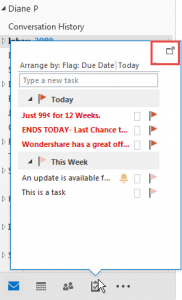 The Task list in the To-Do Bar in earlier versions of Outlook can be customized using basically the same steps. Published October 7, 2014. Last updated on January 22, 2015. Do you need help setting up Outlook or want some one-on-one training? I'm available for hire. See Training and one-on-one assistance for fees and to check availability. 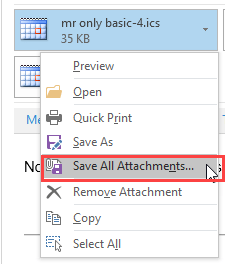 Where is File tab in Outlook? 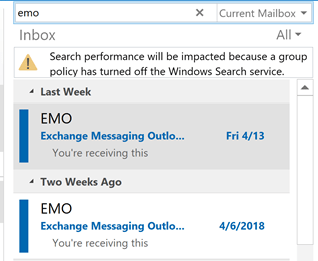 Where are my Outlook Files? Ask questions and share your knowledge in Outlook Forums.